We were informed today that the Twlight Eclipse Series 2 trading card release has been delayed. We originally expected the set to arrive this month, but we now expect to ship orders by October 22nd. We have boxes available for $47. Cases (10 boxes) are $449. 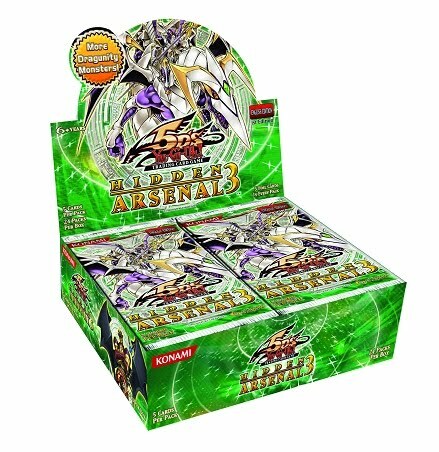 Pre-Selling Yu-Gi-Oh Hidden Arsenal 3! Konami has just announced plans to release Yu-Gi-Oh Hidden Arsenal 3 in December! Hidden Arsenal 3 includes 60 all-foil, all-monster cards - a mix of monsters that work in any deck, plus specialized monsters for exciting new deck themes. The set includes eagerly awaited monsters like Naturia Barkion, Ally of Justice Decisive Armor, Fabled Leviathan, and Gungnir, Dragon of the Ice Barrier. The set includes 20 Secret Rares (1 per pack) and 40 Super Rares (4 per pack). Boxes are available for $59. Cases (12 boxes) are just $679. Click here to place your pre-order! Shadowfist Booster Restock Arrives Today! 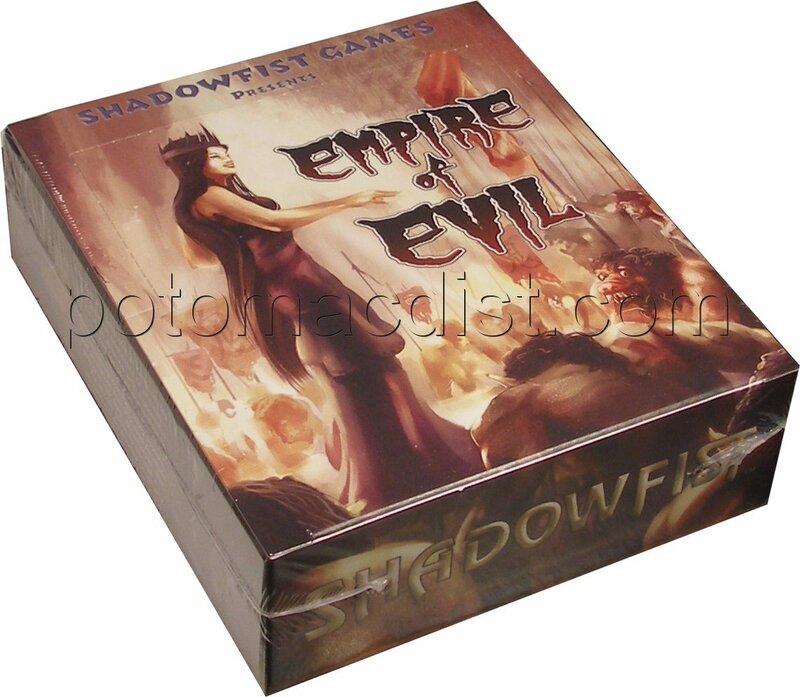 We just received a restock of Shadowfist expansions! Netherworld 2: Back Through the Portals boosters.....$28/box. 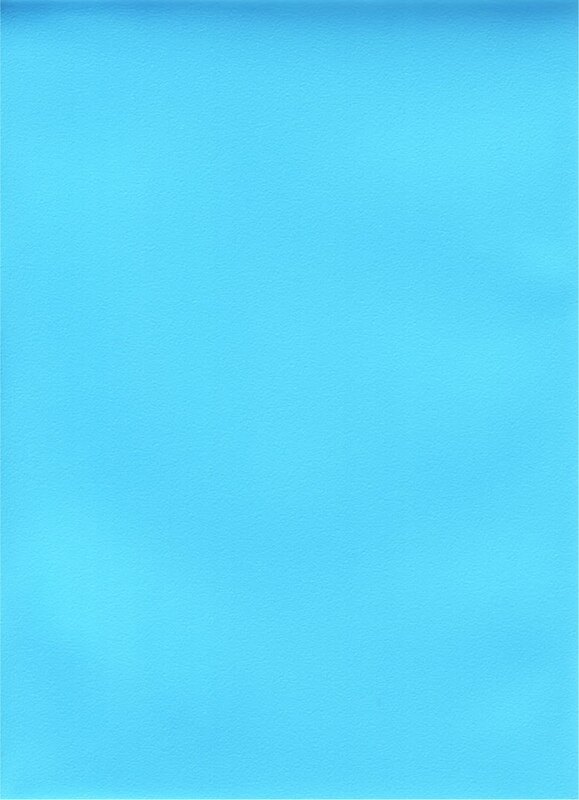 We received an Ultra Pro restock yesterday that included some new deck protector colors - Light Blue and Purple. 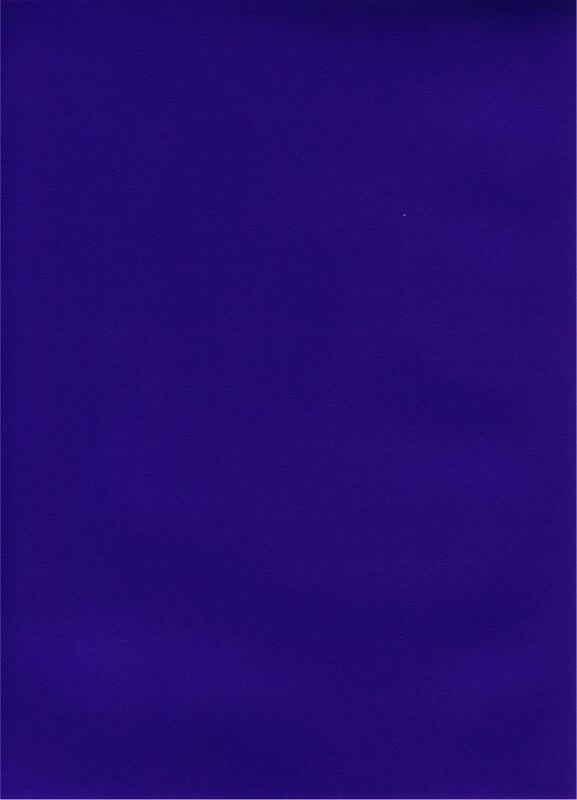 We have both colors available in standard (Magic) size and Yu-Gi-Oh size. Boxes are just $21 (12 packs per box/50 sleeves per pack). World of Warcraft Worldbreaker On Sale Now! 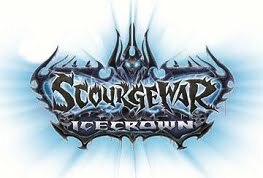 Ice Crown Epic Collection Delayed! The next World of Warcraft expansion, Worldbreaker, is on sale now! Worldbreaker includes content from the upcoming Cataclysm expansion for the World of Warcraft Online Game. The set includes the first Goblin and Worgen heroes and allies, new race/class combos like Dwarf Shaman and Tauren Paladin, Dragon master heroes like Alexstrasza and Ysera, and Heirloom gear with its own unique mechanic. Worldbreaker features 3 new loot items (the rare is a flying mount and the common will be a cosmetic pet). The set includes 270 cards (60 rare, 20 hero, 10 epic, 60 uncommon, and 120 common). Booster boxes are available for $62. Booster cases (12 boxes) are $729. In related news, World of Warcraft Icecrown Epic Collection which was originally scheduled to ship this month has been delayed by the manufacturer. We now expect to ship it by October 30th. Each Icecrown Epic Collection box includes 6 Icecrown booster packs, 5 random foil heroes from Icecrown, 1 Icecrown playmat, 1 Icecrown deck box, 1 Icecrown visual pocket guide, 1 common loot card, card dividers, and a reusable storage box. Boxes are just $27 each! Click here to order. L5R Dead of Winter On Sale! The next Legend of the Five Rings expansion, Dead of Winter, is on sale now! We don't have an exact release date for Dead of Winter yet, but we expect it to arrive some time in December. Dead of Winter is a 166-card expansion. As the icy grip of winter holds sway over Rokugan, the wars that plague its people grind to a halt. For even the inhuman Destroyers cannot stand against the fury of the elements. Although the dead of winter grips the Empire, in the distant ruins of the Ivory Kingdoms, the elements spare their fury, allowing the Mantis to get a foothold firmly established, in an attempt to discover the truth about the origin of the Destroyers. 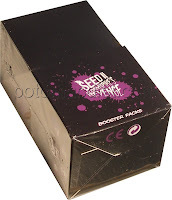 We are pre-selling boosters for $99, booster cases (10 boxes) for $960, starter boxes for $48, and starter sets (1 Crane, 1 Mantis, and 1 Spider deck) for $33. The Spoils Gloamspike's Revenge Has Arrived! It's been nearly 3 years since the last Spoils release, but Gloamspike's Revenge has finally arrived! Exploring the climax of the Seed era and the emergence of the trades seen in The Spoils First Edition, Seed II - Gloamspike's Revenge adds 120 new cards to The Spoils universe with new characters, items, gear, locations, and tactics. Boxes are just $32 each. L5R Empire at War In Stock! Legend of the Five Rings Empire at War boosters and starters may be sold out at the manufacturer, but we have both in stock and ready to ship! All pre-orders were shipped earlier this week. Empire at War boosters are $101, starters are $49, and starter sets are $34. We've also got the new L5R Battle of Kyuden Tonbo sets in stock for $27 each, as well as the L5R Enemies of the Empire 4th Edition RPG book for $32. 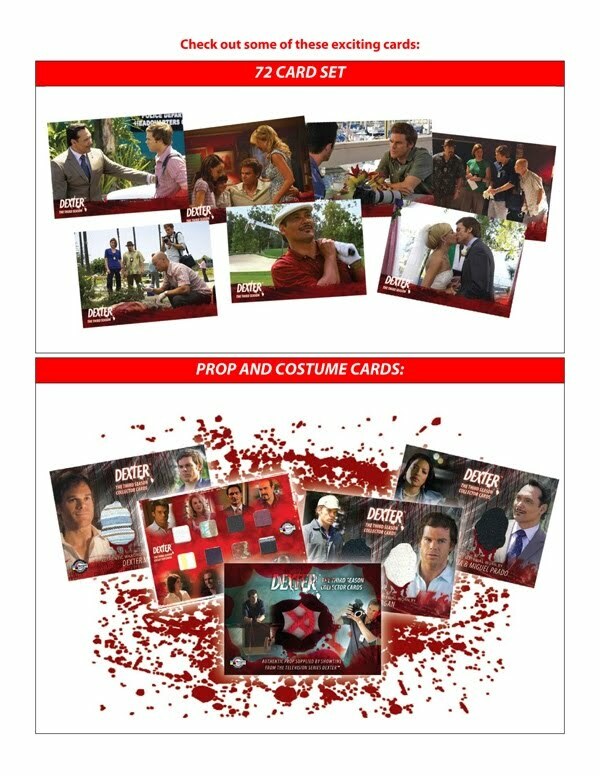 Breygent has released some additional details for its upcoming Dexter Season 3 trading card set. Collectors can look for 29 costume cards - 27 dual costume cards, 1 quad card, and an 8-piece card! There will be 11 different prop cards, 7 different autograph cards, and 2 Metallgloss case cards. Autograph signers include Michael C. Hall, Jennifer Carpenter, Desmond Harrington, James Remar, and Jimmy Smits. Every case will also include a sketch card. Sketch artists include Tim Shay, Brian Kong, Len Bellinger, Jason Carrier, David Desbois, Steven Miller, and Trev Murphy. Customers ordering 2 cases receive a free costume card. Customers pre-ordering 10 cases receive a Master Set! Cases (12 boxes) are on sale now for $749. The set is expected to be released in October. Remember, we pass along all case incentives at the same rate that we receive them. Pre-order 6 cases and get a free Lak Lim sketch card. Pre-order 9 cases and get a free Anthony Tan sketch card (in addition to the Lak Lim card)! Pre-order 18 cases and get a free Heroes and Villains archive box (in addition to 3 Lim sketches and 2 Tan sketches)! Every archive box includes 30 random sketch cards, all pack-inserted chase sets, a set of 5 case topper cards, and a parallel base set. Boxes are $61 each, 12-box cases are $709, and binder cases (4 binders) are $82. Marvel Heroes & Villains is scheduled to ship on October 20th. Click here to place your pre-order. Pokemon Triumpant On Sale Now! 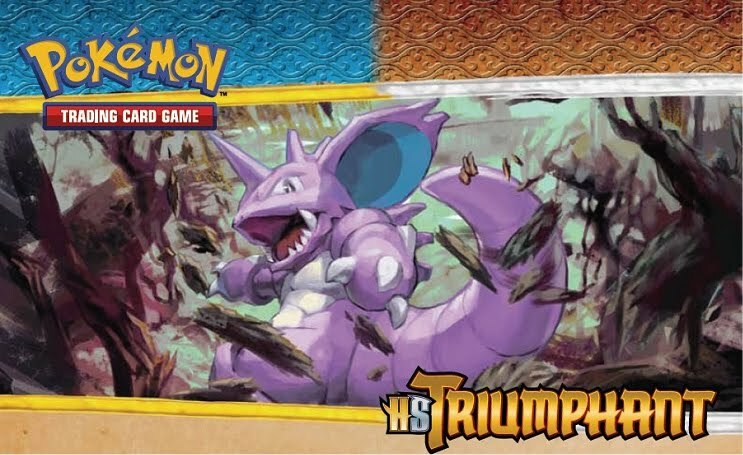 The follow up to the popular Pokemon Undaunted set, Triumpant is scheduled to ship in early November. The new set includes new Pokemon Legends - Darkrai with Cresselia and Palkia with Dialga. The set also includes 8 Pokemon Prime, including Gengar and Machamp, as well as new trainer, supporter, stadium, and holographic parallel cards. There are more than 100 cards in the set. Triumphant Booster boxes are on sale now for $86. Booster cases are $506 (6 boxes). Starter boxes are $68 each and feature two decks built around Mamoswine (Verdant Frost) and Nidoking (Royal Guard). Each deck contains a bonus booster pack and a deck box for storage! Click here to order Pokemon Triumphant. 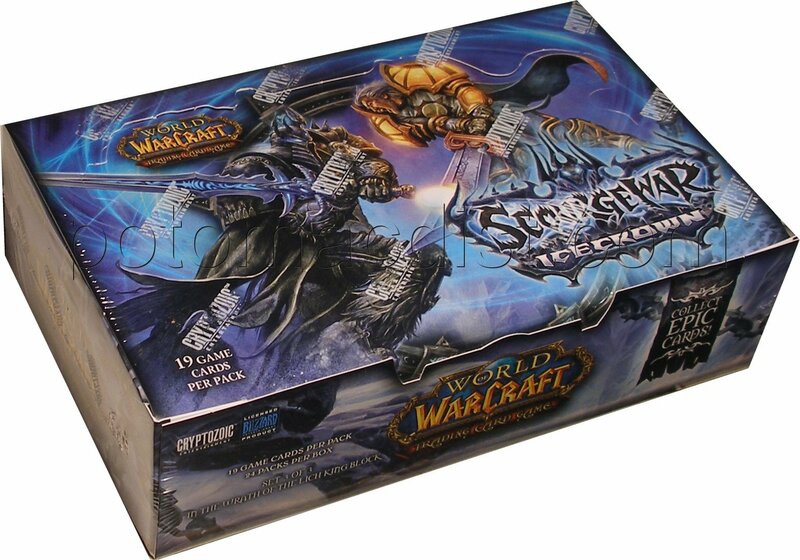 World of Warcraft Icecrown In Stock! Cryptozoic Entertainment's latest World of Warcraft expansion, Icecrown, has arrived. We've shipped all pre-orders. Booster boxes are available for $63 each. Please contact us if you are interested in purchasing sealed cases. Click here to order Icecrown boosters! L5R Empire at War Shipping Monday! L5R Kyuden Tonbo In Stock! AEG's latest Legend of the Five Rings expansion, Empire at War, is expected to ship on Monday, September 20th! Order now to receive our lowest prices on Empire at War. On Friday (Sept. 17), we will be raising our prices from $99 to $101 for booster boxes, $960 to $970 for booster casess (10 boxes), $48 to $49 for starter boxes, and $33 to $34 for starter deck sets (1 of each clan). 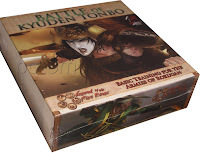 L5R Battle of Kyuden Tonbo sets are in stock! All pre-orders were shipped earlier this week. Individual sets are available for $27. Order 10 sets for just $249. 2010 Topps UFC Arriving Wednesday! Topps' new 2010 UFC trading cards are expected to arrive on Wednesday! Every box includes 2 autograph cards, 2 relic cards, 16 insert cards, and 16 parallel cards! Look for more than 20 first-time autograph signers such as Antonio Rogerio Nogueira, Matt Hughes, and Cain Velasquez, all honored on special "First Autograph Issue" stamped cards. Relics include new Tale of the Tape, as well as Fight Mat and Ultimate Gear cards. Inserts, found 1 per pack, include Greats of the Game, Octagon of Honor, Pride and Glory, Bloodlines, and Fight Poster Review. There are 220 base set cards featuring UFC Fighters, Debuts, Personalities, and Hightlight Reel cards. We have 2010 Topps UFC Hobby boxes available for $57 each. Hobby cases (12 boxes) are just $672. Previous UFC sets from Topps have been red hot so don't miss out! Due to overwhelming orders late this week, we sold through our initial shipment of L5R Battle of Kyuden Tonbo sets. If you ordered prior to today, we expect to ship your order on Monday. We have a second shipment arriving on Tuesday. Any orders placed from this point on are expected to ship then. Individual sets are $27. Order 10 sets for just $249! Heroclix: Web of Spider-Man In Stock! The new Marvel HeroClix set, Web of Spider-Man, has arrived. All pre-orders were shipped earlier in the week. Cases (20 boosters) are available for $159 each. Bricks (10 boosters) are $89 each. We just received updated information from Rittenhouse Archives regarding several products that we've been pre-selling for a few weeks. Rittenhouse also informed us that they will be releasing a new set in December - Star Trek: The Remastered Original Series! 1 Dual Autograph card and 1 Single Autograph card in every box! We are pre-selling boxes for $61, 12-box cases for $709, and binder cases (4 binders) for $82. Click here to place your order. Rittenhouse is producing a very limited number of cases of Warehouse 13: Season One. If you plan to order, please do so soon. We originally were told that the case topper for this set would be a cast photo. Rittenhouse is now planning to include a Volta's Lab Coat Relic card (with material worn by Allison Scagliotti) in every case! 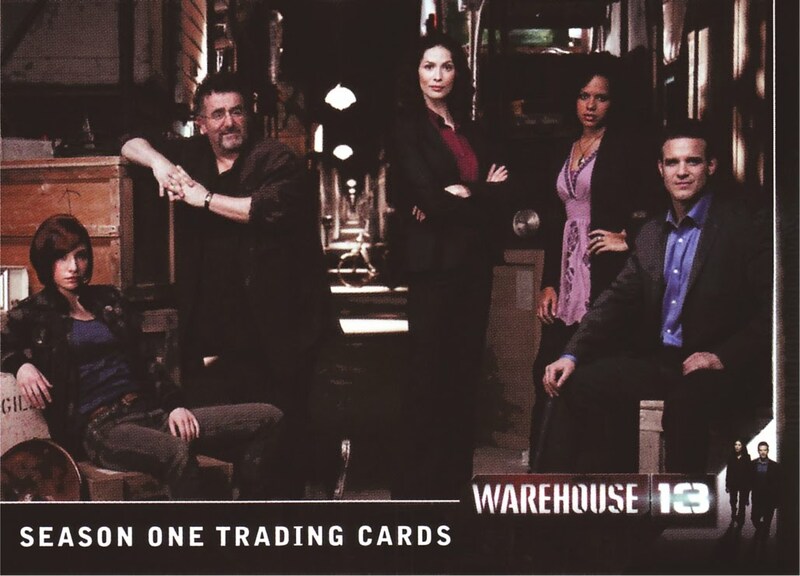 You can order Warehouse 13: Season One boxes for $61, cases (12 boxes) for $709, and binder cases (4 binders) for $82. Click here to order. Rittenhouse has announced some additional details for the Stargate Universe: Season One set as well. Each Stargate Universe case will include a Dual Costume card of Chloe Armstrong and Senator Armstrong. Customers pre-ordering 3 cases will receive a free Lou Diamond Phillips (Colonel Telford) autograph card! Customers pre-ordering 5 cases will receive a free hand-drawn sketch card by Sean Pence! The 15-case incentive remains the same - a free Stargate Universe: Season One Archive box! Stargate Universe: Season One boxes are available for $61, cases are $709, and binder cases (4 binders) are $82. You can place your order here. L5R Empire at War Release Date Set! AEG just announced that Empire at War, the next Legend of the Five Rings expansion should arrive on September 20th. 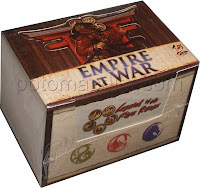 We are currently selling Empire at War boosters for $99, 10-box booster cases for $960, starter boxes for $48, and starter sets (one of each clan) for $33. 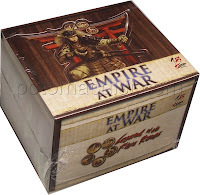 L5R Battle of Kyuden Tonbo is scheduled to arrive a week before Empire at War on September 13th. We are pre-selling Kyuden Tonbo for $27/set or $249/case (10 sets).